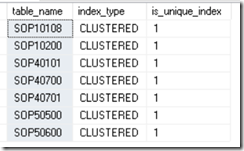 Why does Dynamics GP use Table Heaps (no clustered indexes)? First we should define what a table heap is. A heap is a table without a clustered index. Data is stored in the heap without specifying an order. Usually data is initially stored in the order in which is the rows are inserted into the table, but the Database Engine can move data around in the heap to store the rows efficiently; so the data order cannot be predicted. There are sometimes good reasons to leave a table as a heap instead of creating a clustered index, but using heaps effectively is an advanced skill. Most tables should have a carefully chosen clustered index unless a good reason exists for leaving the table as a heap. Generally I would say we are more used to finding a clustered index on a table, but looking below you can see the more normal picture for the indexes of a GP table. 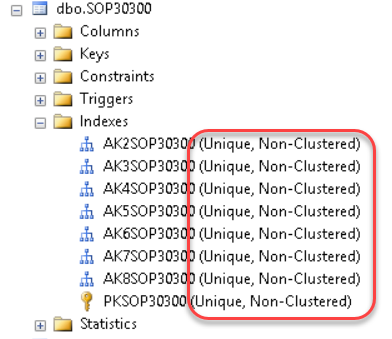 Microsoft Dynamics GP does not use many clustered indexes in its database. 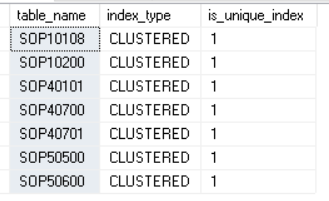 Do not use a heap when there are no non-clustered indexes and the table is large. In a heap, all rows of the heap must be read to find any row. I do wonder about the conditions under which the decisions to not use clustered indexes was made, but have to trust the research was accurate (/S). So the reason? GP didn’t always run on SQL server, it was on ISAM in the old days. The database schema that GP uses owes a lot to that legacy and is the reason for many of the oddities and areas lacking in GP’s use of SQL server and I expect this use of heap tables is also from that legacy and that study showed there were no performance benefits from introducing a clustered index. In Dynamics GP development, we have lots of .dll files around arising from support for many version releases of GP. These files litter our projects and sometimes a dll may go astray and cause trouble by ending up in a folder to which it should not belong. This powershell command is a quick way to look for all the versions of a .NET assembly (dll) version within a folder tree. The versions can be seen on the left and any offending .dll files that are not in the correct directory for their actual version number can be quickly and easily identified. This problem happened today, first time for a few years, but it used to happen regularly (every few months). 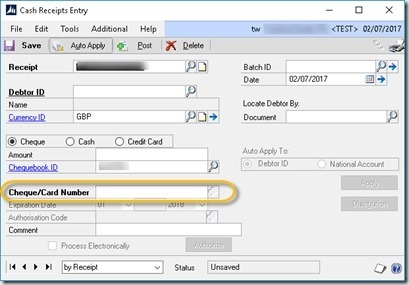 The issue is that the auto populated sales order number in sales transaction entry gets overwritten with the number from the quotation number range. My guess for the circumstances of this issue, is that the SOP Entry window is open with a quote showing, but not actually started yet. Somehow the order type gets changed from quote to order in the forms internal variables (integration or misbehaving code or connection lost or something?). 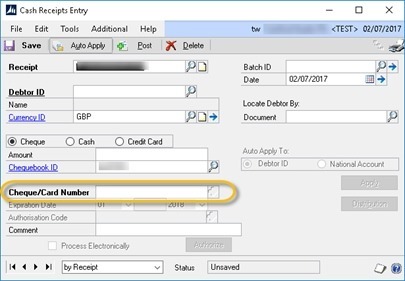 The Sop Entry window is then closed, or the order type drop down is changed to order from quote, causing the GP window to attempt to return the unused quote number to the pool to be reused via the next sop number field in sop setup. However as we are saying that the window variable that holds order type is incorrect and thinks this is a quotation, the window actually returns this quote number to the next order number field, when it should have returned it to the next quote number field. Hence the next sales order number becomes a quote number! eek! Ok, to fix this is easy, right? -open SOP setup by navigating to Microsoft Dynamics GP>>Tools>>Setup>>Sales>>Sales Order Processing then click [Numbers] button. Correct the next document number to what it should be (see SQL later to find this), note that you need to close both windows to ensure it saves, and be quick if users are generating numbers you will get a optimistic concurrency violation on save. The problem you then encounter is that if you have distributed sales force, spread over the globe, they will have picked up numbers from the incorrect sop number range, and have them sitting like a time bomb on new sales orders in the sop entry window. Even when you change the number in the sop set up window, if any of those users choose to subsequently close the Sop Entry window, having not used the erroneous sop number, then that number will again get returned to the sop next number field in sop setup, undoing your good work! This is exactly what happens, the number keeps jumping back to the quote range of numbers and you fight a losing battle against the users. One answer is to ask all users to exit sop entry, make the change then let them back in, with a distributed work force, that may not be actually easy to contact or worse, not in front of the machines when you need to make the change, this is not practical. In this case, I have used the script below to keep resetting the number so immediately the users corrupts the next sop number, it gets corrected again. 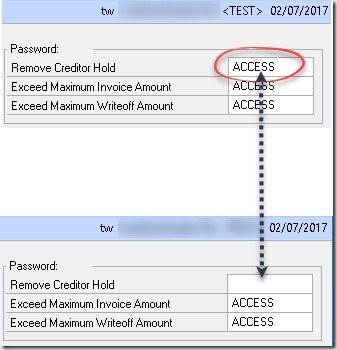 Leave the script below running in SSMS until you are confident all users are now on the correct range of numbers. So long as the next SOPNumber is within 1000 of the actual last number used, then the GP client will scroll up through, finding the actual next sop number that is available for allocation. The exact number is not critical, and it wont matter until 1000 orders have been entered. After 1000 you will get an error message saying a new sop number could not be found. Do let me know if this was helpful, in the comments, keeps me motivated to write more! When making a manual payment normally, after selecting the payee, the cheque book attached to that payee is queried for its next cheque number, that is then auto populated into the “Document No” field shown. During month end we found all of a sudden this was not happening, instead the document number was being left blank. The previous payment only ten minutes earlier had been fine, correctly generating the number. Shortly after Sales ledger started complaining that cheque number field in cash receipts had suddenly become mandatory. See in the above screen how the Cheque/Card Number is bold, indicating it is now mandatory, before this was not the case. 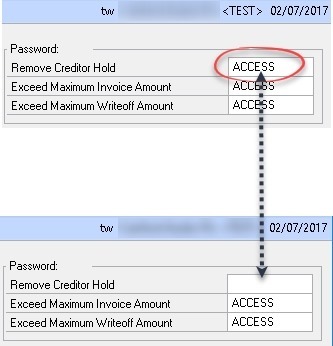 A third event also happened at the same time, which was that the password on payables for removing creditor holds, that previously was blank, suddenly had defaulted back to its default value of ACCESS. 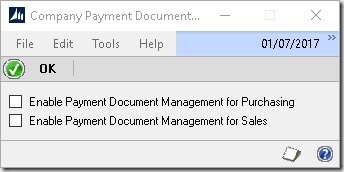 After some digging I figured out the cause of this was that the Payment Document Management module had been switched on somehow and had not been configured so was causing the blanks. Unchecking both check boxes turned off the module and behaviour resumed as per normal. It is a mystery how this occurred but maybe someone else one day might find this post useful, if so do comment!